Rachel, this one’s for you. One of my amazing bloggy friends commented on my recipes with a mutual detestation for mayo, so I went out to find her an amazing treat that I knew she’d love. I loved it, too. That treat turned out to be a find from The Brownie Whisperer raving madly about these chickens from Trader Joe’s stuffed with cream cheese. And yes, I realize that this is the worst photo in the world. If you hate it, buy me a goddamn camera. He took me home, and cooked me up a chicken. They’re bigger than I thought they’d be. They’re not nugget sized, like I assumed, but a little bigger than a regular cutlet, I’d say, eight inches long, maybe two across. Either way, they’re hefty. The chicken is coated in panko bread crumbs, so it’s really crunchy, and a buffalo seasoning. It took thirty five minutes exactly to cook this in the oven, but it’s worth the wait. When we took it out, the cream cheese was oozing out the sides. It looked fantastic. I waited for it to cool, and then dug in. The first thing you notice with these is the crunch of the panko. The chicken is easy to saw through and just gushes cream cheese. The buffalo flavoring is subtle. 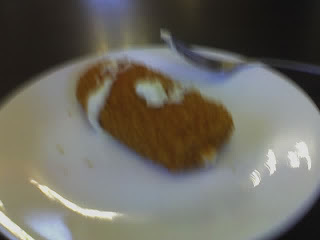 It’s noticeable, but doesn’t take away from the taste of the chicken or the cream cheese. The cheese is delicious and creamy, the perfect filler in here. Every bite has a nice amount of cream cheese in it. My only complaint was that it’s an awfully messy food, so it’s not ideal for on the go, but I think that if I had to have a last meal, it just might be two of these in a baguette or a hoagie roll with some cheese on top! They would make an amazing sandwich. And the coolest part about these is that the chicken is local, from a town not too far from my own.